No matter how hard you try to postpone the moment, there is not much that you can do about time. Sometimes it is so cruel that it passes by without you even noticing it. How on earth did we end up on the last week of summer, when have not had enough of it? Show me at least one person who would admit having spent an enjoyable and fulfilling vacation with no need to prolong it! I bet there is no human being that would dare to sound such words out. Yet, August is slowly fading away and so are our beloved sunny and warm days. Well, it has been like this since the creation of the universe, so we should already got used to it somehow. To distract you from the gloomy thoughts and overwhelming memories I have gathered a collection of some cool rain coats that would definitely save you from the wet and chilly fall days. Scroll down and choose the one of your dream. What Does A Rain Coat of Your Dream Look Like? Depending on your personal taste and fashion style, you can choose from quite a wide range of coats. Plus, it does not have to be just one piece, does it? The more you have the better it is, especially if you happen to reside in the rainy area. Yet, if you are not a big fan of this article of clothing, there is no need to get a whole collection. Just one single piece would be enough – as long as this piece is stylish and gorgeous. One of the items that I liked the most features an extremely beautiful pattern. The mustard green coat which is presented by Miroslava Duma is designed in a magnificent way. I like the skimming fit of the piece as well as the embellishment that is the main element of the item. The multi-colored patchwork neckline totally rocks the outfit and makes it very saucy and trendy. If you prefer more delicate and moderate shades, then you will definitely love this violet coat. Although the color does not belong to the classic palette of a rainy day, you can still opt for it. Such a shades creates a very sunny and bright mood – opposite to the actual state of weather. Hence, you ought to have in your closet to make your day more positive and shining. Besides, such a cool item of clothing will match all of your outfits, especially the most exquisite and elegant ones. For those of you are in love with military style, here is a piece that you would in love with. 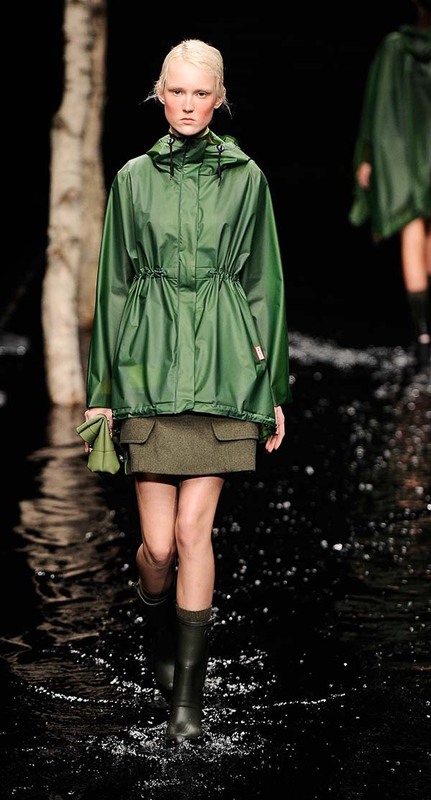 There is no way such a cute rain coat in deep khaki can leave anyone indifferent. First of all, it is the color that makes it stand out – such an item is not too bright or too dim, which is a perfect color solution. Moreover, the short fit makes it a perfect complementary piece for either a pair of baggy trousers or a pencil skirt. If you like to wear shortened silhouettes, then this is what you need. This piece looks extremely unique – that means that you will also stand out from the crowd. Besides the short fit, the coat features a very engaging design. The fabric that the piece is made out of is transparent; this itself is an important detail to mention. Moreover, the trims of the coat are decorated with black elements, which adds up to the great style of this article. There are no limitations in terms of styling this coat at all. Whatever you would like to rock will look good if you combine it with this stylish coat. Last but not least – prints are still on trend. Therefore, I would highly recommend you to opt for a rain coat that features some kind of a pattern. This way you can be sure that you won’t melt in or blemish with the crowd around you, but will always stay in the spotlight. In this case we are talking about a leopard-printed black and white piece which is complemented by a cute bow and other styling accessories. Such a piece is best worn with a pair of jeans and some heels. These were some great examples of how your rain coat may look like. Once again, it is all up to you which coat to go for.